Crocheting culicues are one of the most simple and fun things I've made in a while...oh and they are addicting too! See the curlicue starting to emerge? Now keep going until you reach the end! Love it! Now you can put your curlicues on blankets, as an alternative to fringe on a garment, and one Fiber Flux reader said she even put a few on top of a child's hat...super cute! I love this post, thanks so much for the wonderful information. You are so welcome...hugs back at ya! Me encanta el blog, lindos trabajos, soy tu seguidora. Gracias! My understanding and reading of Spanish is much better than my own writing of it, so thank you so much, you are very kind!! Thank you for showing me how to make the curlicue. I have made a few Christmas wreaths using this technique. I just saw them...beautiful job, love them! I'd love to see your Christmas wreaths. Are they posted anywhere for the public? The curlicues also make great "Nellie Olsen" type curls for dollmakers who make yarn hair. I'm thinking about several on the ends of a scarf!! Lovely Thank You! That is so funny that you said that...I have one I am working on in my basket right now!!! Great minds think alike!!! Could you make this wider and have it be more of a scarf? How would you suggest doing that? Sure! Just make a chain as long as you would want your scarf to be, than add more rows by working in the same manner as that first row. Hi Ladies! I actually just finished my first scarf using your tutorial, but to keep it in a curly cue you need to end the scarf and then begin again at the begin right side facing you. (so you never turn the scarf.) Attach and chain 3 in beginning double crochet, 2 more double crochets in same space, skip two, 3 double crochets, skip two, etc etc, end in same fashion as above. 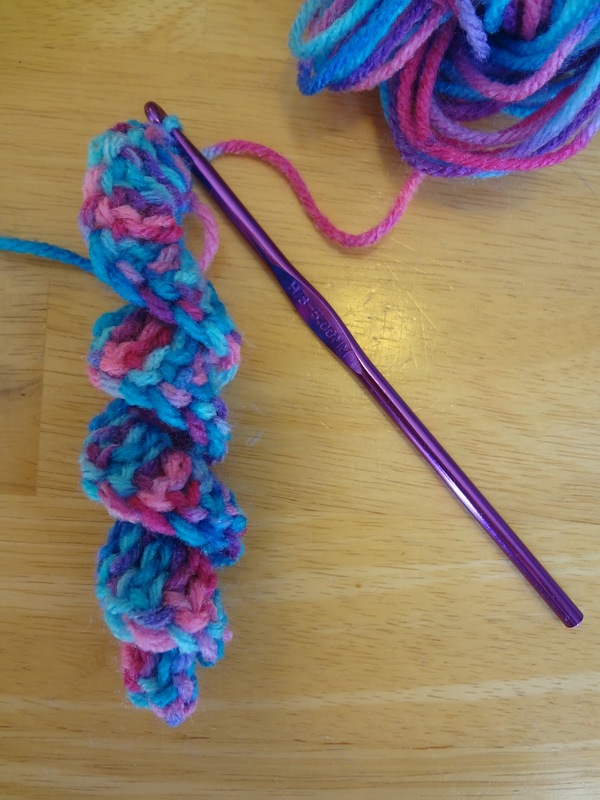 There might be a better way to make a scarf, but to just continue the rows flattens it out. Hope this is helpful! The scarves turn out super cute by the way! My new favorite stitch! Thank you again for the great tutorial! Thank tou so much for this post! Love it !! You're so welcome, that yarn is a whole lot of fun! Very cute and using cotton yarn with a sparkly thread through it makes a very cute icicle too. Also, if you use just a plain cotton yarn in white, you can lightly spray adhesive on it and then sprinkle fine glitter on it. Do you know the calculation of the length of the first chain to the finished curlicue length based on worsted weight yarn? Yes it about the same length...so when you make your starting chain, make it about the same length as you would like for your curlicue to be. I like the technique but how do you attach it onto a scarf. I made one for my daughter and they were falling off when she wore it to school. You could tie them on very tightly, but if it is not staying on, you could always sew them on using the top edge of the curlicue. Just a few stitches and it should be OK. Hope that helps! When I was very young (in the early 1970's) my grandmother used to make these and have two connected by a piece of yarn in the middle. My mom would use them in place of ribbons for my ponytails. Thanks for showing me how to do them. I never knew. Around 30 years ago, I made candy cane Christmas ornaments by doing 5 double crochets to each chain. I makes a tighter spiral, which you can then insert a pipe cleaner through the center of and bend into the shape of a cane. I made them in red with a row of white single crochet for a border which gave it the candy cane effect. I also made them with variegated Christmas yarns. And, like Anonymous (above), my grandmother used to make hair ribbons for me with curlicues on each end. Great ideas, thanks so much for sharing! I made this and used it for a cat toy. Dory loves it. Thanks for the tutorial. Yes this is very cute and fun to do. I've done tons of them in the past. Normally I make the straggler long so I can use that end as a bookmark, and then the curly part to hang out of the book. :) I've also used them for key chains. i used this pattern to make a garland for my small tabletop Xmas tree......made a few extra shorter lengths and gave them away, to my sister(she hung ornaments on her plants at Xmas), and one to my Aunt, which she used around the base of the lamp in the center of her table. My Mom used to make these as pony tail ties for me as a child. Only difference was, halfway through it she would single crochet for about 8 stitches. That way there was a flat space to tie it! Thanks for the simple instructions...I used it to add flare to my flower embellishment for my daughter's shrug. I'm wanting to make a cirlique border for a baby-toddler-preschool blanket I just made for my grandson. I can't picture having them along the top of the blanket... It would drive a person nuts I think. Do you know of any instances where these were used to be an afghan border? Or any idea of what sounds practical? Three sides? All 4? I just can't picture it, but know he'd be comforted twirling one round his fingers while falling asleep. I think a blanket for a little one would be adorable! If you're concerned about it being too much, you could always make the curlicues shorter (start with a shorter starting chain). Hope that helps! My neighbor made these when I was young (I'm 54 now). She made 2 of them and crocheted a long chain between them. My mom would put my hair up in a pony tail or pig tails, then wrap the curlicue chain around the tail and tie a bow. The curlicues hung down as the tails on the bow. Really cute and fun in different colors to match outfits.